QCPC will be offering three drill clinics, a Beginner I and a Beginner II clinic, and a clinic for Intermediate players. Both men and women are invited to attend. Any QCPC member is welcome to attend any of the clinics, i.e., more advanced players may benefit from beginner clinics. The Beginner I Clinic is on Saturdays from 12:00-2:00 PM on Courts 5, 6, 7, and 8. The Beginner II Clinic is Tuesdays from 12:00 - 2:00 PM on Courts, 9, 10, 11, and 12. The Intermediate Drill Clinic (3.0 to 3.5 +) is on Tuesdays from 2:00-4:00 PM on Courts 9 and 10. QCPC will sponsor a bus (with a bathroom) to attend the USAPA National Pickleball Tournament in Casa Grande on Sunday, November 5. The bus will begin loading at 8 AM and will leave Quail Creek at 9 AM. Two of our members, Sharon Kolarik and Mary Hughes, will be playing in Women's Doubles that day, so our club members should have a chance to watch and support them. We will have a potluck lunch, so plan to bring something to share for lunch. The cost is $25/person. More information can be found here. Use this form to sign up. Saddlebrooke Ranch is inviting Quail Creek pickleball players to a fun, social, round robin on their new courts on October 25. Sign up as double pairs in women’s or men’s doubles and mixed doubles, or if you don't have a partner and would like to play, just put Need a partner in the slot where you would list your partner's name. Rating categories are 2.5, 3.0, and 3.5. Saddlebrooke Ranch Pickleball Club will provide fruit and snacks for players in the morning. The Club Bistro is a block from the courts and is open for lunch and happy hour until 7:00 pm. Don’t miss this chance to play as a club with our Robson Community neighbors. Details of the tournament can be seen here, and you can sign-up here. On November 11-12, Quail Creek will host a Blind Date Tournament to benefit the Green Valley Food Bank and Friends In Deed. 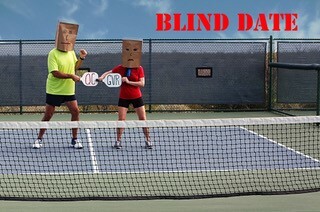 Your date (partner) for this tournament will be randomly chosen from players from Green Valley. There will be Women's, Men's, and Mixed Doubles at the 2.5, 3.0, 3.5, and 4.0 levels. Information, registration forms, and waivers can be found on our website (www.qcpickleball.org) on the right side under Tournaments. Click here to go there directly. Note that the registration deadline is November 6, but earlier sign-ups are encouraged! QCPC would like to hold a Halloween Social on November 1. Please volunteer to help organize this event. Volunteer organizers can plan the time of the event, type of pickleball play, types of food (appetizers, desserts, pot luck), and other activities. It isn't al lot of work because you can have members bring food and/or volunteer to help out with set up, clean up, etc. We have lots of decorations to make our ramada a very scary place! Please contact Sandy Veydt, sandysway88@gmail.com, 520-300-6525, to volunteer to help organize our Halloween Social. Round Robins will continue on Wednesday mornings. Separate Round Robins will be held for Men, Women, and Beginners. Sign-in between 7:30 and 7:50, and be ready to play at 8:00 AM. This schedule will continue through October. A social will be held along with the Round Robin. Coffee, cold drinks, and snacks will be available in the Ramada. Join your Round Robin group along with others to relax during byes and between and after games. Please bring a snack to share. Vice-President: The Vice-President shall assist the President and shall, in his/her absence, perform the duties of that office. The Vice-President will also assume responsibilities as assigned by the Board. Secretary: The Secretary shall record the minutes of general and special meetings of the membership and Board, shall post the minutes in a timely manner, shall be in charge of all records of the QCPC, other than the Treasurer’s, shall maintain an archive of documents involved in the governance of the QCPC, shall be responsible for correspondence as requested by the members of the Board, shall make available any reports required by the Board, shall give notice of all Board and membership meetings at least 96 hours in advance, and shall include the meeting’s agenda with the notice. Please contact Jean Bustard, jeanb@dcmesa.com or 303-921-8139, if you are interested in either position. QCPC dues are $20/year per person. Dues for 2018 are being collected now and are due by January 1, 2018. 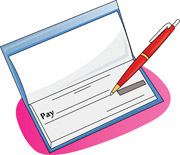 Write your check to QCPC, and make sure that you indicate whose dues are being paid in the Memo line of your check. You can drop off your check at Susan Jones's home, 2620 E Arica Way. She has an box on her front door to collect dues.